August 28, 2018, Adrian, Michigan – Neighbors in an abandoned area of Detroit, people evicted from their ancestral lands and living in a “squatters’ community” in a desert area of the Dominican Republic, and the homeless population in the State of Washington. People in these situations were able to overcome their desperate circumstances, form community, and improve their lives with the help of individual Adrian Dominican Sisters. 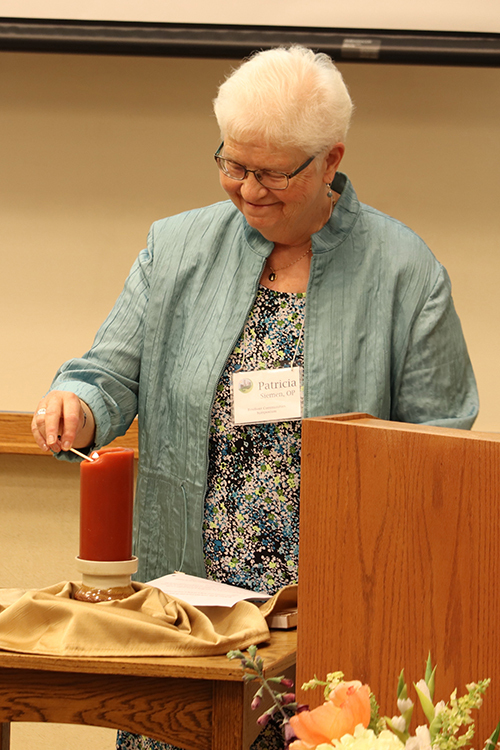 Sister Patricia Siemen, OP, Prioress, lights the Christ Fire at the beginning of Resiliency in our Midst. The Adrian Dominican Sisters’ Leadership Council designated 2018 as a year of study about resilient communities. 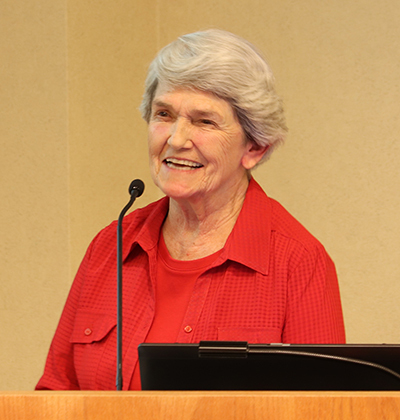 Resiliency in our Midst, held on August 22 at Weber Retreat & Conference Center, brought forward the personal experiences of Sisters Janet Stankowski, OP; Maurine Barzantni, OP; and Judy Byron, OP. While the ministries they spoke of differ, the three Sisters also spoke of ways that they specifically fit the Congregation’s working definition of resilient communities. Many of these communities fit a number of aspects of the definition, but below are highlights. Once the women came to understand that God did not want them to be poor, they worked together to meet the community needs that they themselves identified. Working as committees, they brought to their community prefabricated latrines; medical services, such as weekly consultations by two doctors, a pharmacy, and a medical lab; and Fe y Alegria Espiritu Santo, a school that began with 127 first-grade students ages 6 to 16. Because of earlier lack of educational opportunities, many of the students began first grade at an older age. The school now boasts a K-12 program with 1,500 students and professional teachers who graduated from their school. 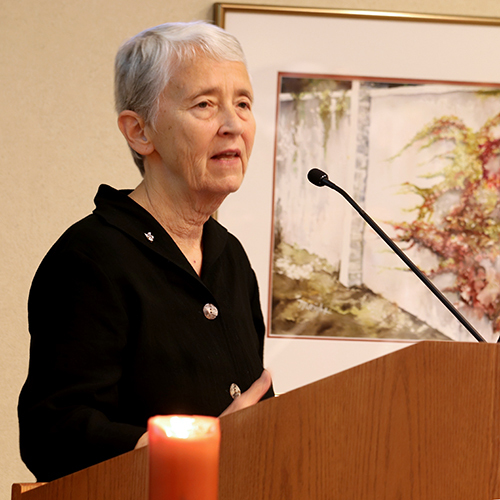 Sister Janet Stankowski, OP, and Associate Patricia Gillis founded Voices for Earth Justice as an interfaith community “praying, learning, and taking action together for Earth justice.” The community was developed to address the environmental injustice plaguing the people of Detroit. In 2011, they purchased five lots with two buildings in the Brightmoor area of Detroit and built Hope House as a “gathering place and resource for neighbors and visitors,” especially around the area of environmental justice. Sister Judy Byron, OP, serves on the Board of Directors of Mercy Housing Northwest, an organization founded in 1992 through a collaboration of five communities of women religious in the Seattle area – including the Edmonds Dominican Sisters, now merged with the Adrian Dominican Sisters – and Mercy Housing, Inc. The goal was to create stable, permanent, affordable housing for groups that could otherwise be homeless, including low-income families, seniors, and immigrants and refugees. Today, Mercy Housing Northwest manages about 54 properties, residential complexes in the State of Washington that offer services such wellness and after-school programs. Many of those complexes were developed through partnerships. For example, Emerald City Commons – a 60-unit complex in Seattle – was developed through collaboration with an evangelical church, which had owned the property and wanted to build housing on it. 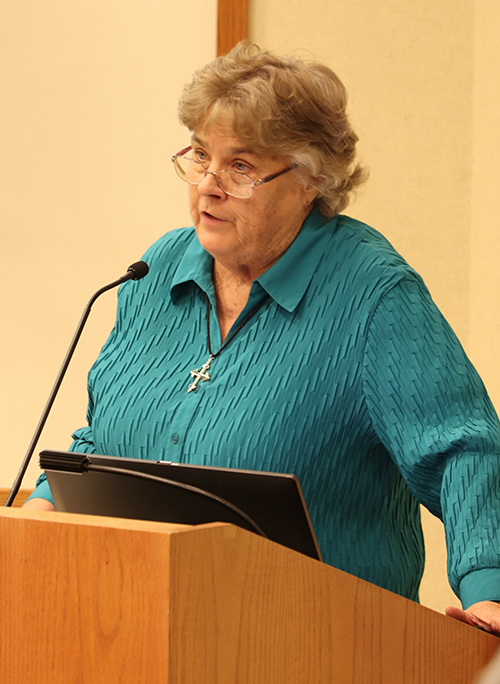 Mercy Housing Northwest partnered with them to develop the complex, Sister Judy said. She explained that Mercy Housing Northwest also collaborates with government organizations, foundations, and other social service and non-profit agencies to develop housing for people in need. The models described by Sisters Janet, Maurine, and Judy can serve as inspiration for the various Resilient Communities Committees in the Congregation’s Mission Chapters explore areas in their geographic region where they can work with local residents to create resilient communities. Feature photo (top): Sister Christa Marsik, OP, poses a question to one of the three panelists speaking during the Resiliency in our Midst educational forum. 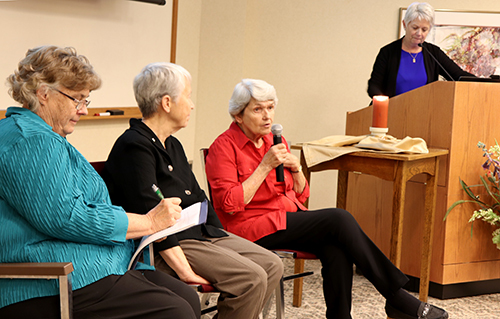 From left, Sisters Janet Stankowski, OP, and Judy Byron, OP, listen to Sister Maurine Barzantni, OP, during a panel presentation. Associate Dee Joyner, Director of Resilient Communities, listens from the podium.